Department was established as "Rehabilitation and Artificial Limb Center" as a tribute to the vision of Late Indira Gandhi, the then Prime Minister of India, who sanctioned Rs 1.25 crores from Prime Minister defence fund for its establishment in 1971. Initially, from 1965-70 Artificial Limb Center was a unit of rehabilitation in Dept. of Orthopedic Surgery, KGMC, Lucknow. Later it became "Rehabilitation and Artificial Limb Center" (RALC) in 1971. 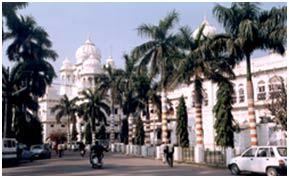 RALC was made autonomous society by the State Government of Uttar Pradesh in 1980. In 1986, it was dissolved & merged in KGMC, as Department of Physical Medicine & Rehabilitation (DPMR). At present, DPMR is the largest multidisplinary inpatient tertiary care rehabilitation hospital in entire north India and is actively engaged in providing high quality clinical care, education and research in the fields of Physical Medicine and Rehabilitation. DPMR is dedicated in improving quality of life of persons with physically disabling conditions. The PMR Specialist doctor is called 'Physiatrist' and he treats the patient as a whole with the goal to help patients of their condition and provide the tools and resources to manage a successful healing process. The continuity of care offers a variety of treatment methods to reduce or eliminate challenges and address recurrence. The services offered are related to musculoskeletal problems, brain injury stroke, spinal cord injury, acute and chronic pain management, amputee, work injuries, orthopedic injuries, sports medicine, pediatric neuromusculo-skeletal problems and the developmental delays, osteoarthritis, metabolic bone diseases, osteoporosis etc. Electrical/heat therapy, hydrotherapy, tractions (i.e. Cervical, Lumbar), exercises to develop coordination and strength, stretching, home care guidance, gait training, neuro developmental clinic etc. Assessment of various needs of disabled persons. – Providing different types of aids and appliances through various agencies. Haematological and bio-chemical examination of blood and urine. 40 ( 30 regular + 10 service beds) bed indoor wards for male, female and children patients.